Silver prices rushed ahead of gold putting on seven per cent to $29.40 as financial markets rebounded from last week’s sell-off showing that the shiniest of metals is still among the most volatile of assets. Data from the Comex metal depository for June showed a monthly gain of 596,793 ounces to leave total silver stocks higher at 143 million ounces. There are many ways to put market volatility to good use even if you are trading with cryptocurrencies. And if you wish to play safe, there are crypto trading bots like Bitcoin Trader that are designed to work in various market conditions while being able to steadily give profits to the traders. One reason for the price of silver being so volatile is the small size of the total market with the Comex deposits worth only $4.2 billion, less than the Facebook founder has lost on his stock holding since the IPO. 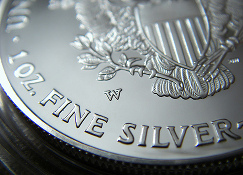 Investment demand for silver of around $3 billion annually is even smaller. Conspiracy theorists would argue that this also leaves silver far more open to price manipulation, although market participants strongly deny this is the case and turn this argument backwards saying why would they bother to fix such a small market. Still the point about price volatility in a small and tightly held market applies, price conspiracy or not. In fact the silver market is much bigger than the physical stock in the Comex with some $200 billion of paper silver traded by silver traders who never take delivery and therefore seem unconcerned that the silver to back this trade does not exist. What if one day they all wanted this silver in physical form? The price would rocket. However, you don’t need to talk in such abstract terms about the potential for silver price rises because of the huge short positions. We have already seen a tenfold rise in the price over the past dozen years and yet remarkably silver is still selling for a substantial discount to its previous all-time high of $50 set in 1980. Our friend at Emirates-NBD Bank in Dubai, Gerhard Schubert actually made that last trade. It’s incredible that this 32 year old record still stands. No other commodity is in this position. Silver is a leveraged play on the gold price. It goes up faster than gold and down faster too. Why are gold and silver linked like this? It is a long historical relationship with the two metals uniquely used as currency over thousands of years. Tutankamen’s hoard of gold is in the Cairo National Museum and his wealth has proven immortal. In fact an ounce of gold has been worth 12-15 ounces of silver on average, very much less than around 50 ounces today. That fact alone gives considerable upside to silver over gold as precious metals gain in value as global central banks create paper money to devalue unsustainable debt levels in the world economy. But don’t expect a smooth ride upwards with gold and especially silver. Then again the real surprise to the upside when it happens should be remarkable.